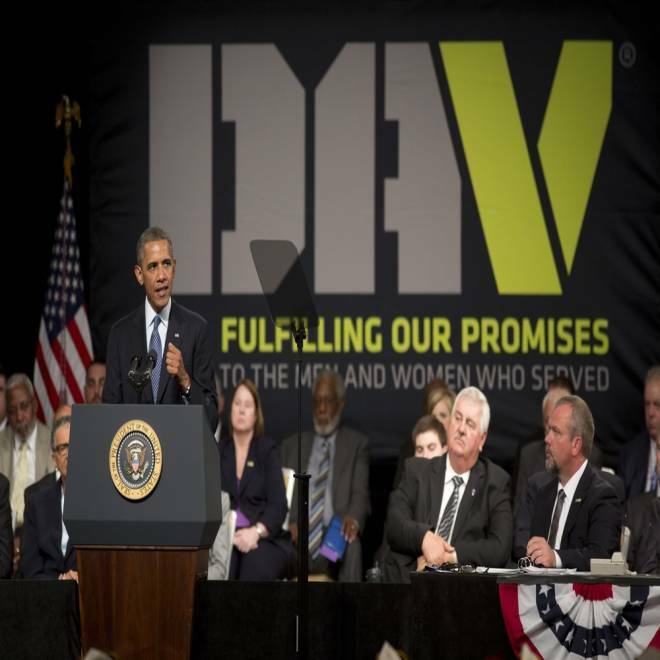 President Barack Obama addresses injured veterans and guests at the Disabled American Veterans National Convention in Orlando, Fla., Aug.10. The Department of Veterans Affairs and the Department of Defense spent at least $1.3 billion during the last four years trying unsuccessfully to develop a single electronic health-records system between the two departments — leaving veterans’ disability claims piling up in paper files, a News21 investigation shows. This does not include billions of dollars wasted during the last three decades, including $2 billion spent on a failed upgrade to the DOD’s existing electronic health-records system. For a veteran in the disability claims process, these records are critical: They include DOD service and health records needed by the VA to decide veterans’ disability ratings and the compensation they will receive for their injuries. At a July congressional hearing, Rep. Jeff Miller, R-Fla., said he was disappointed and frustrated. “The only thing interoperable we get are the litany of excuses flying across both departments every year as to why it has taken so long to get this done,” said Miller, the chairman of the Veterans Affairs Committee. In 2011, the agencies decided the solution would be to create a single electronic healthcare record together. But after two years, the departments’ secretaries in February canceled the plan with little explanation. Instead of a joint system, Panetta said the two agencies would upgrade their own electronic health-record systems and build software that would allow the two systems to exchange files. Panetta said the new direction would allow the departments to meet the goal interoperability and do it for a lower cost. But records show the cost may not be lower. According to contract data, the VA began paying companies for the project in July 2011, as money still was still being spent by both the DOD and VA on the single, joint health care records system. One of the VA’s contractors, Harris Corp., has a multiyear contract with the VA worth $80.3 million to create software allowing the two departments’ systems to communicate with each other, a deal that was signed almost a year before the DOD and VA gave up on a single electronic health record. That does not include the estimated 26,000 service members who will make their way home within the next year from Afghanistan. Nor does it include veterans who have yet to file disability claims. Those pieces of paper can make or break a veteran’s chance of getting the correct disability compensation. The compensation can help offset costs such as rent and car payments for those who may not be able to work because of issues they suffer, such as post-traumatic stress disorder or chronic back pain. In 2012, the average time a claim waited for evidence to be processed - which includes those health and service records from DOD as well as physical exams - was 206.7 days, according to Veterans Benefits Administration documents. "Congress needs to make permanent tax credits for companies that hire our veterans and wounded warriors. It's the right thing to do,"Â Â President Obama says. Debbie Filippi, the first director of the office, said restrictions from the VA and DOD, as well as a minimal budget, kept the office from making progress during her two-year tenure. “It takes time to turn an aircraft carrier,” she Filippi, who retired in 2011, before the cancellation of the joint electronic health-record project. An amendment to the 2014 National Defense Authorization Act, proposed by Rep. Ann Kirkpatrick, D-Ariz., would require the DOD to provide complete service treatment records to the VA within 90 days of a service member leaving the military. Rep. Phil Roe, R-Tenn., in May introduced legislation requiring the VA and DOD to revive plans for the single, integrated health record system. “You don’t spend a billion dollars and say we can’t do it,” Roe told News21.